Joseph J. Maguire – of Dracut, formerly of Woburn, April 4th. Beloved husband of the late Julia J. (Marchese) Maguire. Loving father of Kathy Rosa, her husband Jim of Methuen, Peter Maguire, his wife Judi of Westborough, Martin Maguire of Pelham, NH and Brian Maguire, his wife Wendy of Methuen. Cherished grandfather of Mark Rosa, his wife Tara of Pelham, NH, Dave Rosa of Salem, NH, Ashley Maguire of Raymond, NH, Matt Maguire of Pelham, NH, Julia Maguire of Somerville and Michael Maguire of Winthrop. Adored great-grandfather of Parker, Jaxon, Tristen and Cameron. Dear friend of Judy Sousa of Tewksbury. At the families request, all services are private and under the direction of the Lynch- Cantillon Funeral Home 263 Main Street, Woburn, MA. In lieu of flowers, remebrances may be made in Joe’s memory to St. Jude’s Children’s Hospital 501 St. Jude Place, Memphis, TN 38105. 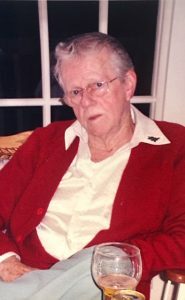 Joseph J. Maguire – of Dracut, formerly of Woburn, died peacefully, April 4th at Lawrence Memorial Hospital in Medford, at the age of ninety-three. He was the beloved husband of 25 years to the late Julia J. (Marchese) Maguire, mother of his four children, and the late June (Figucia) Maguire. Born in Woburn, Joe was a son of the late Peter and Kathryn (McGah) Maguire. He was raised and educated in Woburn and attended Woburn High School. After High School, Joe served his country proudly as part of the US Army during WWII, until being honorably discharged. For over 30 years, Joe worked as a foreman for the sign department for the City of Woburn. He was a quiet and private man who had a deep love for his family. He was also an avid reader- always keeping up with current events, and a passionate sports fan. Loving father of Kathy Rosa, her husband Jim of Methuen, Peter Maguire, his wife Judi of Westborough, Martin Maguire of Pelham, NH and Brian Maguire, his wife Wendy of Methuen. Cherished grandfather of Mark Rosa, his wife Tara of Pelham, NH, Dave Rosa of Salem, NH, Ashley Maguire of Raymond, NH, Matt Maguire of Pelham, NH, Julia Maguire of Somerville and Michael Maguire of Winthrop. Adored great-grandfather of Parker, Jaxon, Tristen and Cameron. Dear friend of Judy Sousa of Tewksbury. Also survived by many nieces and nephews. At the family’s request, all services are private and under the direction of the Lynch- Cantillon Funeral Home 263 Main Street, Woburn, MA. In lieu of flowers, remembrances may be made in Joe’s memory to St. Jude’s Children’s Hospital 501 St. Jude Place, Memphis, TN 38105. At the families request, all services are private and under the direction of the Lynch- Cantillon Funeral Home 263 Main Street, Woburn, MA. In lieu of flowers, remebrances may be made in Joe’s memory to St. Jude’s Children’s Hospital 501 St. Jude Place, Memphis, TN 38105. Kathy and family I’m so sorry for your loss. We’ll never forget the good times and laughs at our family gatherings… such good memories. Rest in peace, Joe. Sorry for your loss, Joe was a good neighbor and a gentleman he will be missed. We are thankful for his service and an honor to know a member of the greatest generation. Our thoughts and prayers are with the family.